A waterfall cascades down the rock cliffs at Cape Breton Highland National Park in Nova Scotia, Canada. 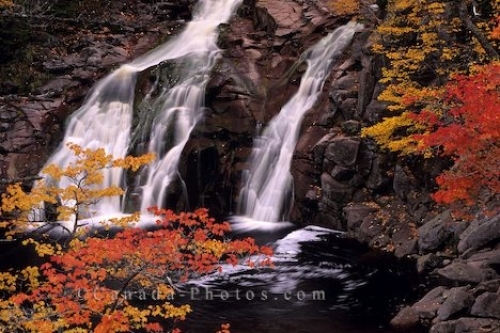 The leaves change to radiant hues in Autumn and surround the picturesque waterfall in Cape Breton Highland National Park in Nova Scotia, Canada. Autumn is a nice time of year to visit Cape Breton and waterfall pictures are even more beautiful as they flow down the rocks into the water below. Picture of a waterfall in Autumn at Cape Breton Highland National Park in Nova Scotia, Canada.